There are a group of conditions that make-up what is called heart disease. The problems may be associated with the muscles, the valves or the heart rhythm. It could be cardiomyopathy, atrial fibrillation or heart failure. Some other problems affect the blood vessels, like hardened arteries which can lead to strokes. Most of the heart problems are caused by unhealthy food, lack of exercise, smoking and alcoholism. So can high blood pressure, infections and birth defects cause heart problems. 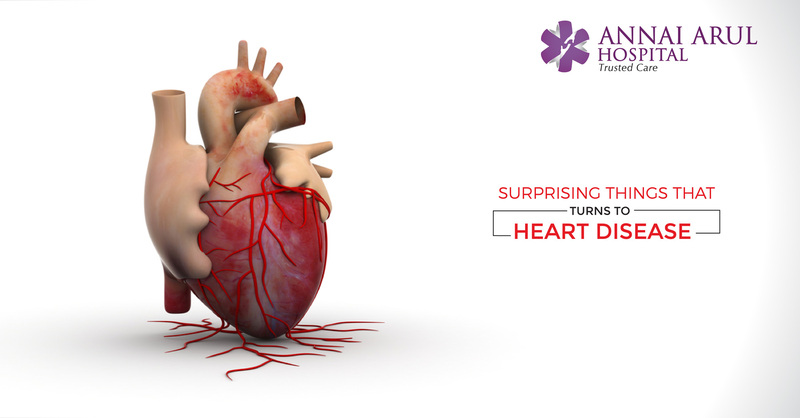 Apart from all the above there are certain surprising reasons that can cause heart problems, here are a few of them. We all know about noise pollution and its health impact but we may be unaware that traffic noise starting at around 50 decibels can raise your blood pressure and the risk of a heart failure. For each 10 decibel increase, your odds of heart disease and stroke goes up manifold. It is believed that the whole phenomenon is linked to how the body reacts to too much stress. The reason though not established if you have migraine in all likelihood you may get stroke, chest pain and heart attack. If heart attacks run in your family or you have already had a stroke of some sort, you may not be able to take medicines called triptans for treating migraine, since these medicines are usually narrow the blood vessels. With the birth of each child the risk of heart disease goes up for both the parents. But women who get their first period before there are 12 years old or stop having periods before they are 47 are more likely to have a stroke as well as a heart disease. A woman’s risk goes up if she has had a miscarriage or had her ovaries or uterus removed. It is observed that for every 2.5 inches less than average height, the chance of heart disease goes up by 8%. Shorter people tend to have higher cholesterol and triglyceride levels. Apart from this being shorter leads to less healthy choices and habits and this could be another reason. It is said that having few or no friends and being not on terms with your relations increases the odds of getting heart disease.In loneliness the blood pressure actually rises and symptoms of stress appears. It is hence better to join a walking group, a club or sports activity in the neighbourhood to prevent the ill effects of loneliness. Although the stimulant drugs can help you focus on a short term basis, in the long run they cause high blood pressure and increase the heart rate. Overtime this could lead to heart problems. A violent, bullied and abused childhood including seeing harm done to others can be linked to lifelong high blood pressure, obesity, and type 2 diabetes when the child turns into an adult. All these problems in turn are pathways to heart problems of various kinds. The stress in early childhood and the ways adopted to overcome this stress could later lead to many heart problems and health issues.